Our lovely newborn daughter, Lilia, thoughtfully deferred her birth until halfway between the birthdays of her Mama and Papa. This gave us time to finish two projects that I'd been dreaming of. Unfortunately, I am not a sewing/crafting/knitting woman. I don't rule out being one at some point in the future, but I am not one now. This is why I am inordinately stoked that we got to make something ourselves for our girls and why I feel the need to tell you about it. 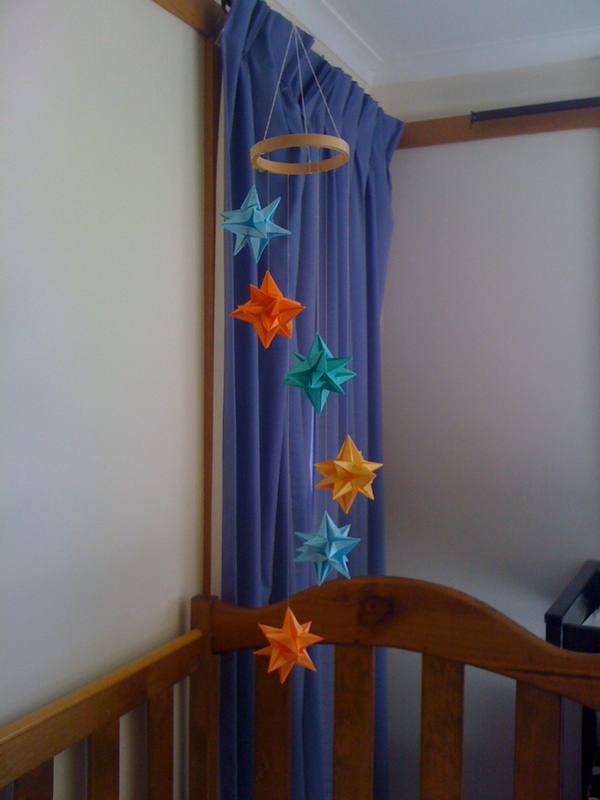 Our former next-door neighbour gave us their mobile when Eve was born, but it was a shaky, noisy, flashy mobile (yep, Eve loved it), and ever since it squealed its last I've been dreaming of something a bit more...Etsy. After a burst of "pinning", I came up with an idea that would utilise my husband's origami skills. He consented and selected this lovely three-dimensional star pattern. I am beyond happy with this project, especially since it cost us absolutely nothing in cash (I had an old embroidery hoop on hand from my single days and my husband has copious amounts of origami paper from his). I got to sit around in my overly-ripe state and read Anthony Trollope's "The Warden" aloud while Peirce cyphered origami instructions in Slovakian. What could be cozier? 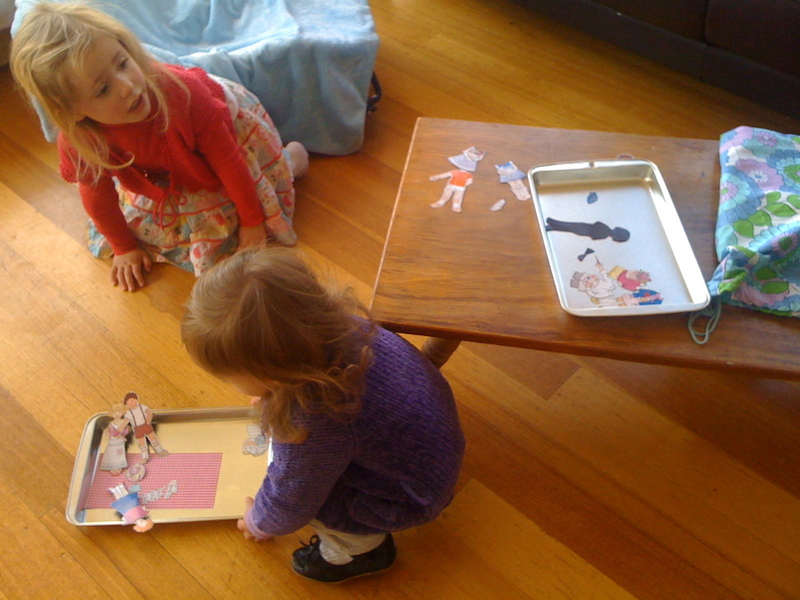 My almost-2-year-old, Meg, has been feeling rather left out that her older sister can play with paper dolls and she can't. I had long suspected that magnetic paper dolls might be the answer, but I couldn't really find the $40 to buy them locally. My wonderful mum made lovely drawstring bags out of some fun floral fabric we had lying around, and I bought two small cookie sheets/trays ($3.28) from Big W to use as a backdrop and container for the dolls. Meg has been very proud and excited to have her own paper dolls, and we made a set for Eve as well. I gave them to the girls the day Lilia was born. Cautionary note: the biggest expense was - you guessed it - the magnetic paper, which I purchased at OfficeWorks. $20 for a packet of five sheets. This becomes depressing when you look online and see that the same product would have cost you about $8 from Michaels in the US. 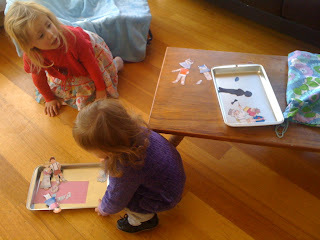 However, I'm still very happy that I was able to make two sets of magnetic paper dolls for my girls for under $30 total. I promise I'll get back to posts about books soon. On the non-fiction front, I'm enjoying Dinah Roe's biography of an important Victorian family, "Rossettis in Wonderland", and slowly but surely working my way through Augustine's "The City of God" (and I mean slowly - don't look for a post on that one before next year!). That mobile is lovely! And I'm so impressed with you for making your own paper dolls! I'd love to read that book about the Rossettis. And this reminds me--I must post an update in our DCD Facebook group :D.